Michael Habets, Md7’s Key Account Manager for the Benelux Region of Europe who works in the Md7 office in Maastricht, Netherlands, doesn’t usually attend site walks. However, this particular walk was not typical so he decided perform the work personally – and as a result his calves were sore for days! You see, Michael spent fifteen hours in the winter, walking on a beach in thick sand. He estimates he walked a total of 27 kilometers in total over two and a half days with his backpack and gear in tow. All this in search of the best site acquisition strategy for deploying small cells to provide coverage on a beach in Walcheren, the popular tourist area along the the coast of Zeeland (the westernmost province of the Netherlands). The local community and business owners wanted the coverage to help support the tourist-based economy, driven by Dutch and German tourists on holiday during the summer months. The county conducted their own study and requested the help of mobile operators. Gaining community support can sometimes be challenging, but this case was different. 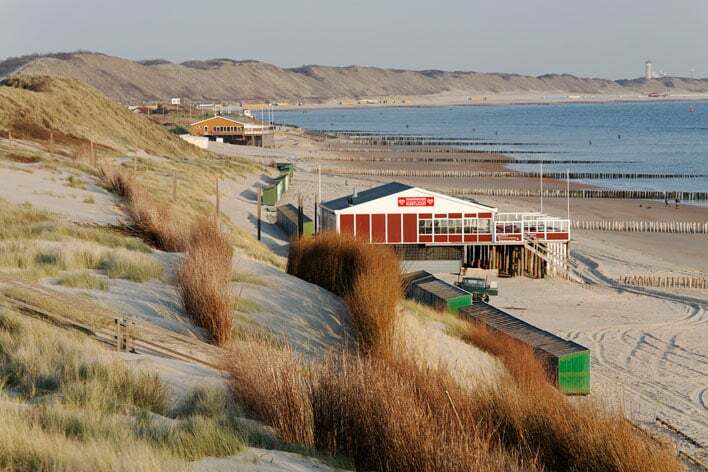 As you can see from the accompanying photos, this popular tourist location during the summer months has beautiful beach pavilions every few hundred meters along the shoreline where vacationers eat Fish (Zeeuwse Garnalen / Zeeuwse shrimps) and drink pints of Heineken and the Belgian beer, Jupiler, each summer. Due to the dunes, no new power can be brought in and each small cell node must be powered by the existing electrical system at each beach pavilion. That power was originally installed decades ago. Additionally, a microwave daisy chain had to be designed from pavilion to pavilion for backhaul. This too was a challenge due to the high winds from the sea. According to Michael, it was an unusual but fun project as he was able to help in the deployment of the latest technology in order to provide much needed coverage and support the local tourist industry.